Shop for framed pictures of Jesus Christ, Mary and Saints. Each holy image is set in a 2" antique gold wood frame with a linen liner and encased in a glass. The prints are authentic reproductions of Adolfo Simeone Art from Italy and hand assembled in the USA. 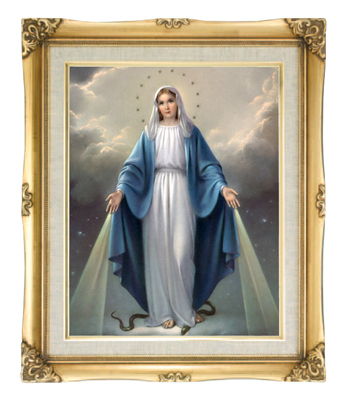 This collection includes our large catholic wall art where each piece measures 16" x 20". The holy picture comes ready for wall mount.